I've been eying the classic medieval sword from windlass for a bit now and given the track record of that company have been hesitant to pull the trigger. It's a type X according to their description and is a peened assembly. Does anyone here have any experience with this sword? I know they tend to be hit or miss so I'd like some opinions on it before I spend my hard earned clams. Thanks in advance. If you have any specific questions please feel free to ask. I've had one of these sword's Mike, and I didn't like it. Aesthetically, the sword look's decent, though the cross-guard is a little long in my opinion. What I didn't like about it, was the handling was all wrong. The grip is too small both in length & diameter. It want's to twist in your hand, and the overall feel was very unbalanced. Given the weight of the blade, and the shortness of the handle, along with the small grip, it just didn't feel good at all. Well your certainly not talking me out of the purchase! It looks wonderful in your pictures. I've really owned Albion and A&A and the only experience I've had with windlass was not a good one. yet that was a long time ago and things seems to have improved drasticly. Just like you I plan to customize the sword with a new grip and a slight aging of the hilt. Is there a way to get that made in india off the blade? If it's lightly etched I would think you could grind it off. Also is the blade stiff or is it whippy? Whippy blades seems to be common for anything over 30" with Windlass. Anyway thanks for the info. I'll pick one up from KOA later today. It's not an albion or an A&A, but again, for the money, it is fun sword. It is a fun project sword if nothing else. The blade is a bit whippy, not as stiff as my albion type X blade, but nothing scarry. I have done quite a bit cutting with it and it holds up fine. One of the first things I did was to remove the "made in india" off of the blade, was a very, very light etching. I am pretty sure I just used the grey scotchpad to remove it. Is there a way to get that made in india off the blade? If it's lightly etched I would think you could grind it off. If I remember correctly from the last Windlass I purchased, a coustille I think, the logo seemed to be some sort of printed on greasy gunk protected by a plastic film and it was easy to scrape off whatever it was and wasn't etched into the steel. Assuming they are still doing it the same way. As Jean mentions, it's just a sticker. You have to do some rubbing with acetone or something to remove it, and I'd personally do that to the whole blade to remove the "varnish" coating, but it leaves no trace of any markings when done and only takes a few minutes. There seems to be no consistent way they mark them. The one on my classic sword is actually a bit of an etch, or some sort of silkscreen but it is not a sticker (as seen in my photo), I don't really remember. The other side had a hologram sticker. On other windlass's of mine the Made in India is a sticker, or not even there. whatever they are, they are easily removed. I gave it a shot. I went with KOA just in case as they have a great return policy. The worst that can happen is I don't like it at all and send it back. I've noticed with the few windlass I've held is it's either a hit or a BIG miss. We'll see how this one turns out. I'm certainly not expecting an Albion yet it seems to be an attractive sword for the money. Thanks guys. It's good to have opposing opinions on this so there's no shocks when It gets here. If I keep it the first thing that'll happen is I'll take that damn varnish off. I'm not a fan of over shiny blades. I figure this will be a fun blade to customize and if I mess it up I'm not out $600 bucks or so. I dont' like overly shiny blades, either, unless they are meticulously finished. This is why I'd suggest taking a gray Scotchbright pad to a Windless blade. It adds a lot to the overall appearance, to me. There was a discussion on the term "whippy", frankly many of the original type Xs I have seen are very flexible, they would most likely be called whippy by a modern collector. 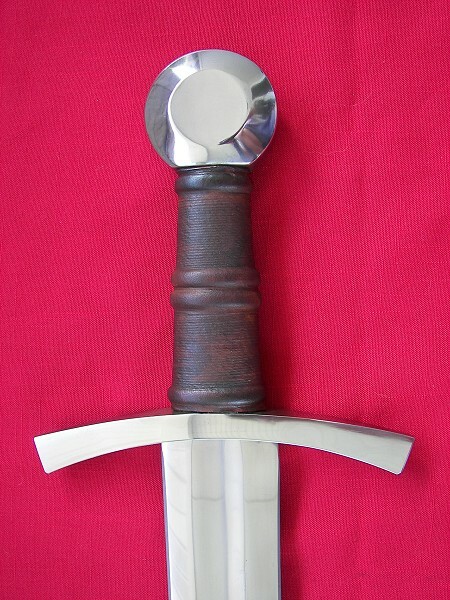 I have never seen the MRL Classic Medieval Sword in person, but from the picture it is really off for a type X, the short diamond cross section at the tip is wierd, the cross is long, and the pommel small. Frankly most of these can be over looked, but I'd be concerned over the construction. It has been sitting around for a long time, some of the older models are a bit shoddy. The newer models are supposedly better, although I have yet to examine one. The first and only sword I purchased from MRL came out at around the same time as the Classic Medieval Sword. The sword I purchased turned out to be more work than it was worth. I stripped the sword down and found that the underside of the pommel was lightly braised to the tang. The tiny peen was just for looks. The cross had a much to large slot for the tang, and needed to completely be re-made. I needed to extend the fuller and remove the diamond cross section. Afterwards the edge geometry had to be re-set on the belt sander, and by allot of hand sanding. The whole blade was then re-heat treated and polished. The pommel had to be recessed and sunk about three inches lower on the tang, the hole was still large so the excess was filled with lead. If the sword had held no personal value I would have simply scrapped it. A few cycles of lemons juice or yellow mustard darkening/etching of the blade creates some subtle activity on the surface of the blade and looks when polished up using the scotchbright like a well used but maintained sword and it seems to do a good job of getting rid of any modern grind marks and gives a satin finish with some light random surface texture. The effect can be very subtle or if etched more deeply and then blued followed by polishing one can get an almost " damascus steel " effect or just the variations one might see im Medieval steels of varying harness or composition due to impurities in the blade. The lemon juice work better for an etched effect and if one uses a patterned toilet paper and soaks it in lemon juice some of the pattern etches in the steel, by doing numerous cycles of etching and cleaning the pattern is randomized: The trick is to find a toilet paper with an interesting pattern to start with and avoid over repetitive " cute " flowers. For what it's worth, I haven't seen a lacquered blade from Windlass in many years. I don't think they do that anymore. They're very highly polished, but all of the ones I've seen in recent years were protected by some kind of sticky protective wax or grease. It wipes off with a cloth, but if you want to do anything involving rust (including "antiquing" as well as bluing or browning) you'll need to use engine degreaser on those parts. in recent years were protected by some kind of sticky protective wax or grease. I own one and have handled several. The 'whippyness' factor is variable from one to the next. The one I bought is relatively stiff for the type and is completely solid in the hilt. Previously I handled (and passed on) another that was overly flexible and highly prone to vibrations when struck at the hilt, and another on-line review describes one that was loose in the hilt but managed to stay together. Yet another reviewer on sword-buyer's guide was completely happy. The usual hit-and-miss Windlass story. I find mine to handle OK - if one is used to viking/early medieval types...short handles and far-out PoBs just go with the territory. Mine has a PoB of around 5", actually on the lower end for swords of this type. The parallel edged blade is not going to win any prizes for dynamics, but it packs a punch. I agree that the grip could be improved - the smooth oval cross section is not conducive to easy edge alignment. Apparently they can take a beating (google tire pell). "The Windlass Classic Medieval surprised me more then any other. I did not expect this sword to hold as tough as it has. I thought the tang might be too thin but so far I am wrong. I did not like this sword so much until I started using it on the tire-pell. It is 3 lbs 3 oz and has a long blade so it easy to accelerate fast and hit hard. The cross guard was somewhat loose from the day I bought it. The leather grip is also a little loose around the tang but the sword has held together despite over 2000 blows on the pell so far. After extended use the slightly loose grip around the tang gets a little annoying. If not for this minor imperfection the sword would be perfect. I have used a hammer to tap the peening. It helped make it tighter. Forget about thrusting, this is a thin cutter and the blade will fold on you, but half-swording thrusts work well. The blade is sold unsharpened so I sharpened it with a $1 sharpening stone. It is not a tatami eater but it is ideal for breaking up people inside mail and padding. I have destroyed thin metal pipes with this sword. The edge damage was minimal. I hesitate to recommend this sword because of the tang looseness inside the slightly miss-sized handle, but it is not a bad sword." In addition, I would comment that this sword is a mail buster. The sword and its handling may feel akward and heavy to people but it was not designed for unarmored combat. This is a military sword, not a dueling sword. Each blow must be powered from the hip. Powering blows from the hip tends to be easier with a two handed sword because your hands are bound together and you have to twist you hip, at least a little, in order to get some reach. With a single handed sword many people will just swing their arm (because they can). Try resting the blade over your shoulder and twisting just the hips to get it moving. All power comes from the legs. It is easy to cut to your sword side (right) like this with little effort. Its takes some coaching and practice to cut off the shoulder to the off-side (left). Hand goes forward in straight line, no arch. When holding a shield, your shield-arm should compensate for your bodies twisting to keep the shield in front of you. The two arms act independent of each other. For fighting mailed opponents with a shield this is the sword I would use. It will break up people inside any mail and padding. I have destroyed thin metal pipes with this sword with almost no edge damage. Its not a trophy sword by any means, it is a very plain and effective tool of war. Hell yeah - let's here it for the shield busters. Not every sword has to handle like a 15th century civilian sword. Incidentally, I would put this one at Xa - it comes pretty close to some of the blades that Oakeshott put in this category in Records. I agree with the person above who said the guard is on the long side for its type, but not outlandishly so when compared to e.g., the sword of St. Maurice / Turin. And apparently curved guards and pommels of this type were found on late viking era X and Xa blades by Leppaaho, so the combination is not completely unhistorical. The little details are another matter - but this is a Dodge, not a Porsche. The guard are a little long for my taste too. They have hit my in my wrist with the guard as I roll the sword from my top two finger to the bottom two as I swing. Not everyone uses this method though. Some people I have met just hold the sword with the bottom two fingers throughout the whole swing (using more hip) in which case the guard does not interfere and may provide some additional protection and hooking capabilities. I would call it a Type X rather then an Xa. The taper is very minimal and the blade balance is very forward. That's why I cut some of my guard off :>). Also, since this picture I removed the gloss with a grey pad. This is not the grip that comes with this sword.